There are two stories running in ‘The Big Empty’, both of them dealing with emptiness, either literal or metaphorical. There’s Dean and Sam, struggling with the emptiness left behind by too many losses and taking it out on each other (and Jack – who is also struggling with the emptiness of being orphaned and not knowing who you are). 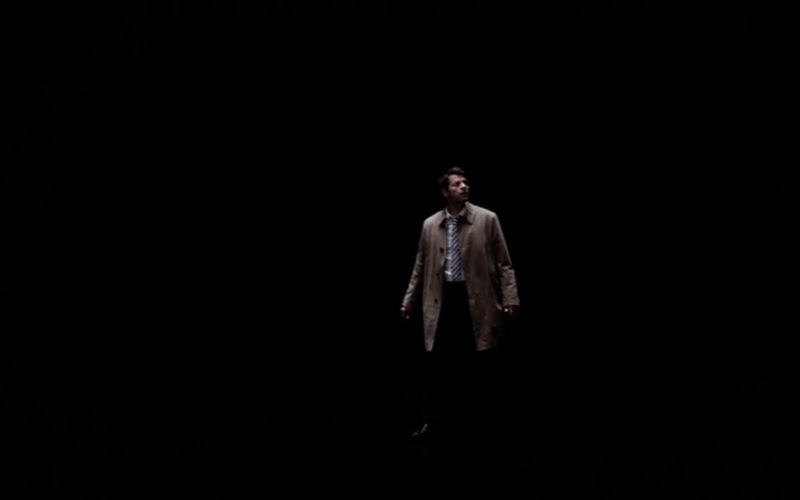 And there’s the literal Big Empty, where Castiel awakened at the end of last episode to find himself alone. When this episode starts, however, Cas finds himself alone no longer. There’s an entity there with him that has his face and form, but it’s not exactly good company. 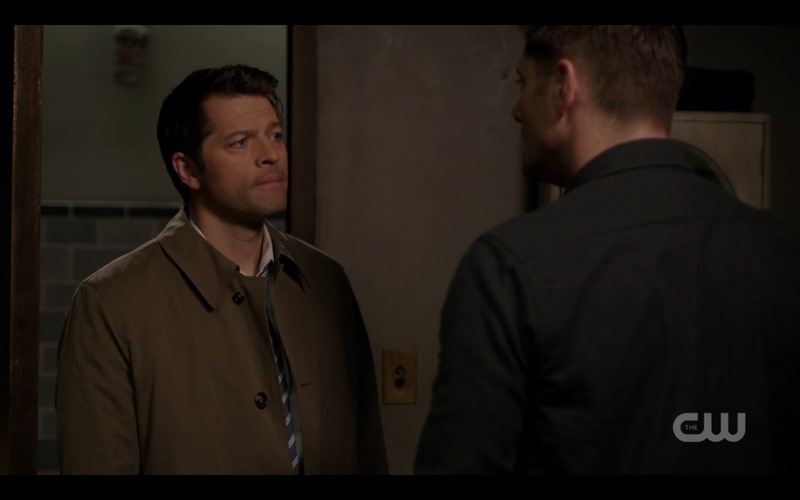 In fact, it’s pissed as hell that when Cas woke up, he did too. The Empty is apparently the place where angels and demons go when they die, and they pretty much just slumber there, which means the Entity can slumber too. He loves sleep almost as much as I do, and that’s really saying something. 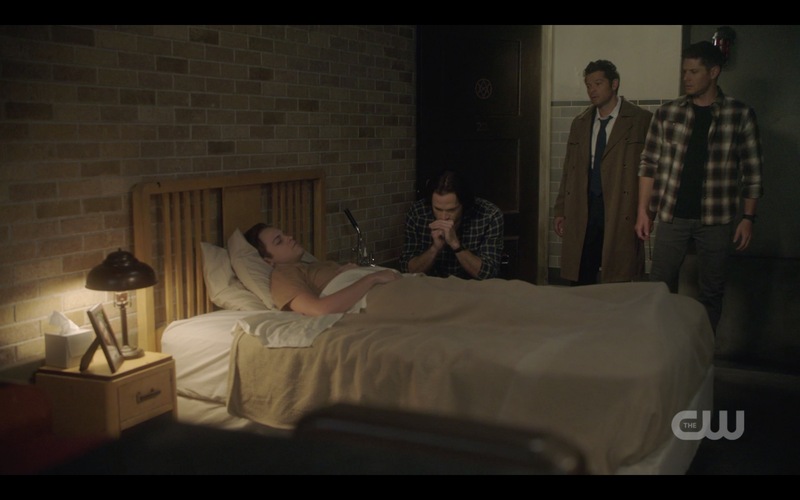 That Castiel is now keeping him from his cherished sleep is making the Entity very cranky – which he takes out on Cas with a lot of physical abuse. Ouch. Supernatural has played with characters confronting different versions of themselves before – Dean confronting future!Dean in ‘The End’ memorably comes to mind – so Cas confronting Entity!Cas isn’t unprecedented. I was caught off guard, though, by the way Misha Collins plays the other version. Because he’s very very different! I wasn’t sure whether to laugh at Entity!Cas or be chilled by him, or maybe a little bit of both. He seemed to have a little bit of Alastair and a little bit of Zachariah and possibly a little bit of Balthazar in him too. He almost seems friendly, or at least amusing, until he punches you in the stomach. Again, ouch. 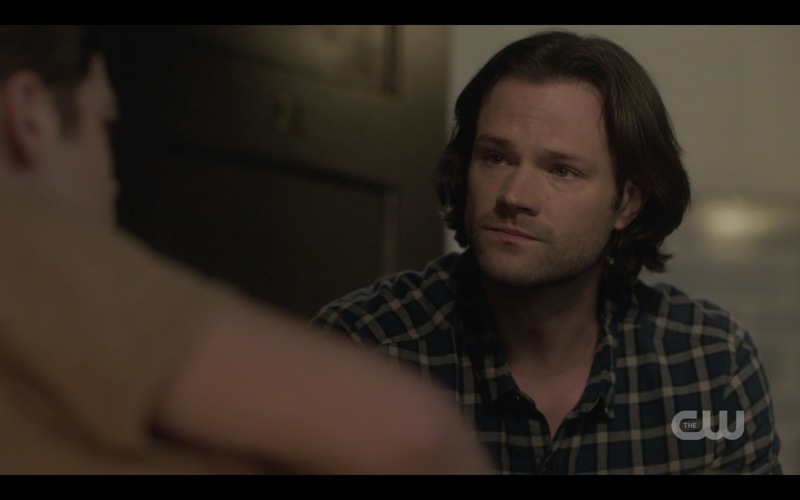 I was so exuberant over Supernatural’s penultimate episode of the season that I went into the finale episode already an emotional wreck – in the very best of ways. I honestly sort of wanted a while to just savor all those wonderful warm feelings, but of course Show just couldn’t let me do that. I barely had time to grab another glass of wine before the familiar notes of Carry On Wayward Son were making me even MORE emotional. 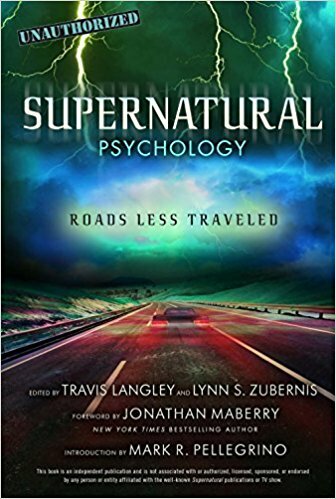 There are so many things that happen that are special when a television show has been on this long and had this much impact – even the band Kansas, who recorded that classic, tweeted about the season finale, knowing that every single fan was going to go nuts when Supernatural’s unofficial theme song was played. The recap took us through a season of ups and downs, through a lot of episodes that were painful to watch and a few story lines that didn’t work for me like I think the show intended, and ultimately ended up where the last episode left off – a Winchester family hug. It has taken me another 24 hours to figure out why I had such a strong emotional reaction to this episode – and to give the episode more props for where it intended to take me even if I didn’t enjoy the ride. The thing is, I loved the last major Cas-centric episode, as my reviews loudly proclaimed. I’ve empathized with Castiel’s painful sense of not belonging anywhere, because there’s nothing in the world more painful for humans and sometimes Cas is just as human as the rest of us (thanks to Misha’s ability to invest the character with emotional nuances). I was moved by Castiel’s near death and his need, in what he thought were his last seconds, to make his feelings clear to Sam and Dean; I was moved by their reaction too, that powerful moment when they each clasped a hand and pulled him up. I had to gush to Misha about his performance in that episode repeatedly (sorry, Misha) and to Richard about his directing (sorry, Richard) but that scene really worked. That scene was Team Free Will re-established. And it wasn’t one way. Sam and Dean also took down their barriers and made themselves vulnerable in their relationship with Cas; not as explicitly perhaps, but Jared and Jensen are so good at what they do that we could clearly feel it and see it. Castiel was accepted as family. So that’s the lens with which I viewed ‘The Future’. That the bond between the three of them was close and tight and important. That made the things that happened in this episode very painful. I’ve felt the same way when one of the Winchesters lies to the other(s). It’s such an extraordinarily painful thing when someone you love and trust is deceitful, so it hurts to see it. 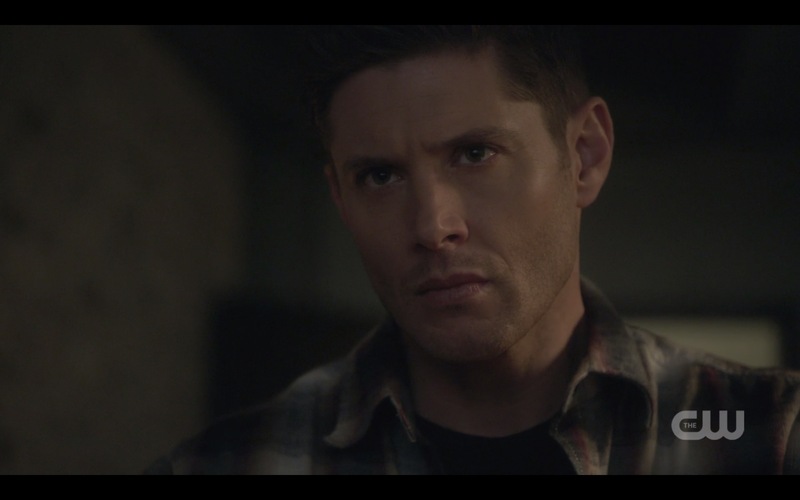 As much as Dean is repeatedly angry in this episode, it’s clear that underneath that anger is hurt. He allowed himself to love and trust Cas, so perceived betrayal hurts like hell. Hence my frequent use of OUCH in this review. It HURT. That said, perhaps that’s exactly what Show wanted me to feel. That last episode did such a good job of setting up the emotional connection between Cas and the Winchesters, and sometimes that is exactly what this Show does when it’s getting ready to punch you right in the heart. It’s a bit of a Supernatural tradition dating back to Kripke, and it’s most definitely been the cause of entire lost days of my life railing and screaming and generally shaking my fist. That’s because I care – a lot. I care about Cas and Sam and Dean and I care about how they care about each other.